Just like colors and their unique textures, there are countless options when choosing the edge profiles for your granite countertop. So what are edge profiles? In short, they are custom cut or ground edging (sides) of your countertop to add an aesthetic look, rather than simply having a straight edge (though that is still considered an edge profile itself). 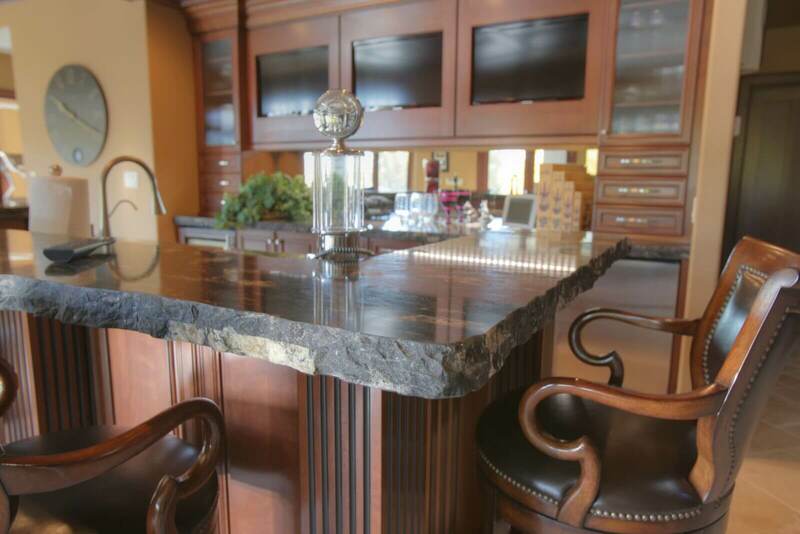 Edge profiles are very defined and easy to see, meaning they can change the design style of the countertop, and either fit with, or clash with the design choices already in your kitchen, bathroom, home bar, etc. In this article, we will provide some insight into the types of designs and styles of edge profile options available to you, to help you make an informed decision with the confidence that your edge profile will match the design of your room. We can divide the edge profiles into the following categories; Basic Edges, Stylized Edges, Laminated Edges, and Unique Edges. There are many more edges than are listed in this article, but we will go over some common, and a few uncommon edge options. The straight edge is the most basic edge without any design or flair added. Simply two 90 degree angles (AKA: two right angles). This edge is the straight edge with the sides of the adjoining faces having been rounded slightly. This edge fits well in a room without clutter or depth, keeping things simple. The bevel edge can have various angles and lengths to the beveled edge, which is a cut downward sloping face. Though basic, this edge looks very sleek in a modern kitchen, and reflects light well on the edge, showing off the profile. This edge has been rounded completely, creating a smooth, consistent curve from the top to the bottom of the granite countertop. The 1/2 Bullnose is a halfway rounded curve that stops at the bottom of the countertop. This is another classic look, simple but softer looking than the straight edge. This edge appears such as a beveled edge except that the bevel itself has been ground inwards creating a channel or groove. This is a historically classic bevel, lending a more artisanal aesthetic reminding you of old world cafes, governor’s mansions, and the fleur de lee. Extreme bevels are bevels that angle almost the entire length from the top to the bottom of the countertop, and with the knife edge having the bevel on an incline, rather than a decline. This style is seen in more modern kitchens with harder edges. Laminated edges are any edges that have a second layer of granite on the edge, almost exclusively below the main granite countertop edge. This creates the look of double-thickness, and both top and bottom can be edges to any design. You can combine Ogee and bullnose, double-ogee, a knife edge with a half bullnose, etc. This is where the edge has been chipped or chiselled away, creating a very rough and raw look. This is a very new and modern look that works great in natural rooms that use a lot of wood or deep wood colors. There are many other custom designs available on the market and too many to list here. Once you choose your granite countertop, you can apply a design checklist (link to designing your kitchen blog) to your choice of edging to create the perfect customized look for your granite countertop.